I teach junior high and high school English (Yes, I probably am insane) at Websterville Baptist Christian. You didn’t really need to know that about me, either the teaching part or the insane part, but I had to start the column off in some way, and thought you might be interested in what I do, as least a little. Where I teach has nothing to do with my probable insanity. In fact, in a tiny plug for the school, (and I won’t even charge you extra) I will say that if you want a really great education for your kids, our school is a wonderful place to get that. You might want to check it out. In our great school, in my classroom, on the wall right behind my desk, hangs an 8×10 picture of two hands. Yes, two hands. You probably know how you can hold your hands, touching your index fingers together, and your thumbs together, and can make the hole between them ‘heart’ shaped. Well, that’s what those two hands are doing in that picture. The unique thing about it is that the right hand is that of my daughter, and the left hand belongs to a friend of hers. The picture was taken when they were at summer camp together, years ago. My daughter was adopted into our family when she was only 11 days old, and her hand in the picture happens to be dark brown. Her friend’s hand, forming the other half of the heart, is quite light. The picture was taken in color, but is also one that our society would refer to as ‘black and white.’ It is, after all, a picture of a young black girl’s hand, together with a young white girl’s hand. What amazes me most about that picture is not the hands themselves, so much as the space between them, and that shape that they outline in their uniting. 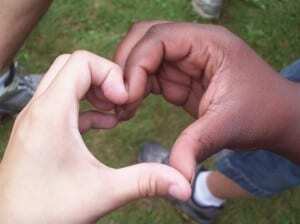 They form the universal symbol of love, the heart, and they do it only through a deliberate, united purpose to do so. If either hand was removed, the image of the heart, that symbol of love, would obviously vanish. February is traditionally known as the month of ‘love’ in our country. It is the month of compassion, and of showing a deep caring for our spouse; our significant other. More than perhaps at any other time of year we express just how significant that other person is, on and around the 14th day of this month. That special day, St. Valentine’s Day, also arrives only about six weeks into a brand-new year, each year. (It’s funny how that happens.) As this particular new year has begun, I have been sadly reminded of the divisions that have rocked our country recently, and for far too many years of our history. Many of our people have felt divided politically, racially, religiously, and socially, for a long time. My hope is that in this new year we will be able to come together, to help each other, and yes, to love each other. After all, we are Americans. As such we should be working to emphasize the ways we are alike, more than how we differ. We need to show the world that we are the caring, just, and ‘equal’ people we have so often claimed to be. I have to say, I do love that picture that hangs behind my desk in my room at school. When I see it, it always, firstly, reminds me of my favorite quote from Dr. Martin Luther King Jr.’s famous ‘I Have a Dream’ speech: “I have a dream that my four little children will one day live in a nation where they will not be judged by the color of their skin, but by the content of their character.” Amen, Dr. King! That picture is a symbol, to me, of all the beautiful things we can accomplish when we look past our differences, and unite our hands and our hearts, as a couple, as friends, and as a great nation. As with the hands, we can do it only through a deliberate, united purpose to do so. Happy New Year! Happy February! Happy Valentine’s Day!